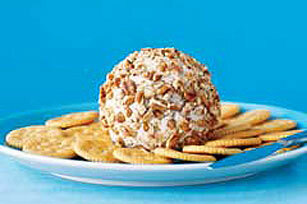 A trio of cheeses—cheddar, blue and cream cheese—are blended, shaped in a ball and rolled in chopped pecans for an easy and classic appetizer spread. Save 6 grams of fat and 2.5 grams of saturated fat per serving by using PHILADELPHIA Neufchatel Cheese, KRAFT 2% Milk Shredded Reduced Fat Cheddar Cheese and RITZ Reduced Fat Crackers. To speed-soften 8 oz. cream cheese, microwave on HIGH for 15 to 20 seconds.